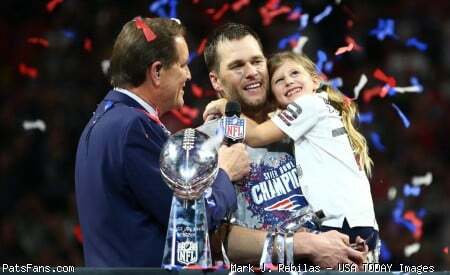 Heading into the New England Patriots Week 15 matchup with the Tennessee Titans, it began on a somber note as news was passed along via Rob Gronkowski’s Facebook account that a friend and trainer of his named Dana Parenteau passed away at the age of 42 , and he was going to dedicate the game in his honor. Gronkowski has arranged to have five of Dana Parenteau's family members attend the game, including Dana's fiancee. During pregame warmups, teammate Chandler Jones did his best to lift Gronkowski’s spirits and fire him up with some chest bumps. The first chest bump wasn't good enough! @RobGronkowski pic.twitter.com/raazGaGLUm (@leelinddds ) – vid credit. It didn’t take Gronkowski long to pay tribute to his friend, Gronk would score a touchdown on a third and three play from the five yard line in the first quarter. 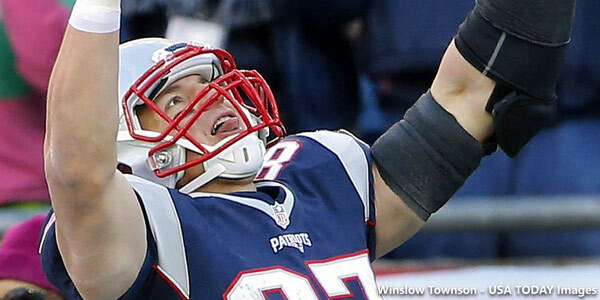 As soon as Gronkowski crossed over into the end zone, he raised his arms and pointed to the sky. The Patriots took the early 7-0 lead. Gronk retrieved his spiked TD ball yesterday because he's going to sign it and give it to the family at his friend's funeral. Trying to find parking in Southie. Two things that are equally impossible. Rob Gronkowski's 65th touchdown catch in 66 career starts. Following the Gronkowski touchdown pass, Chandler Jones continued his torrid pace this season after causing this strip fumble that was recovered by Akiem Hicks and returned for a touchdown giving the Patriots a 14-0 lead and the rout was on. Hicks for Hooman might be the quietest huge move of the season. Fullback Josey Iosefa, who came off the practice squad just days before Sunday’s game, made his presence known on the field during his first game action of the season. The Patriots appear to have a growing list of finding “diamonds in the rough” for the running game despite the mounting injuries. Joey Iosefa is a 247 pound fullback for the Patriots who will truck stick anything and everything in his way. The Patriots defense remained stout throughout the game, Malcom Butler collected this interception at the goal line late in the first half and it the Titans defense couldn’t muster much more as the Patriots won their 12th game of the season by a final score of 33-16. Defensive end Alan Branch busted out some moves. Patriots fans hearts briefly stopped at this moment. A lone Titans highlight from the afternoon was this touchdown pass on a 57-yard bomb by quarterback Zach Mettenberger to wide receiver Delanie Walker after breaking multiple tackles. No one could take Delanie Walker down on this ridiculous 57-yard TD catch. The Pittsburgh Steelers defeated the Denver Broncos later on Sunday evening 34-27 which ensured the Patriots a first round bye and no less than a two seed in the NFL playoffs for a record sixth consecutive season. Devin McCourty was feeling “fresh as lettuce” monday morning following the victory as he recovers from his ankle injury. This entry was posted in Patriots Commentary, Patriots Photos, Patriots Video and tagged Akiem Hicks, Alan Branch, Bill Belichick, Chandler Jones, Delanie Walker, Devin McCourty, Jamie Collins, Joey Iosefa, Rob Gronkowski, Tom Brady, Zach Mettenberger on December 21, 2015 by Robert Alvarez.